ALL’S not quite Fair with food around the world – but Woking as a borough are doing their best to make sure shoppers trade up for the next fortnight. Woking Fairtrade have called on the local community to support Fairtrade Fortnight (until March 8) and bring about a positive change for millions of farmers and workers in developing countries. Fairtrade ensures farmers across the developing world receive a fairer price for their work. Campaigners in Woking will join forces with the rest of the country and share stories from the people who grow our favourite products, to remind everyone of the dramatic difference Fairtrade makes, and of why it is still needed. And to that end, Woking Fairtrade held a Fairtrade Chocolate Tasting last Friday (February 27) in the evening at WWW-UK’s Living Planet Centre. The evening was be led by Tom Allen of Trading Visions, a small Fairtrade educational charity working with the children of Ghanaian cocoa farmers, via its links with Divine Chocolate, to produce resources for schools in the UK. It also included a screening of the new short film, Fairtrade Matters, which beautifully illustrates the way the sales of Fairtrade products changes lives. Becca Rowland, from Woking Fairtrade, said: ‘Over the past 20 years, Fairtrade has paved the way for fairer and ethical trading, but there is still a long way to go, as trade isn’t working for the poorest farmers in the global south. “We want to drive more benefits for farmers and workers in the Fairtrade system and make sure we can support those who aren’t, so they can receive a fairer deal too. 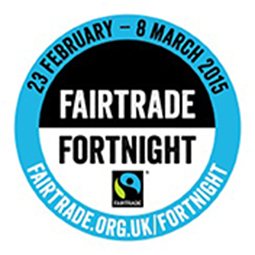 It is easy to get behind Fairtrade Fortnight 2015, and we hope as many residents in Woking as possible will join us.